Scissor lifts have been cutting a path of productivity through the construction market since the 1970s. Although the designs haven’t changed drastically over the last four decades, the technology behind these jobsite workhorses has greatly changed, making scissor lifts safer and more productive than ever. Finding the right lift for the job requires selecting a machine that allows operators to complete the task at hand as efficiently and safely as possible. 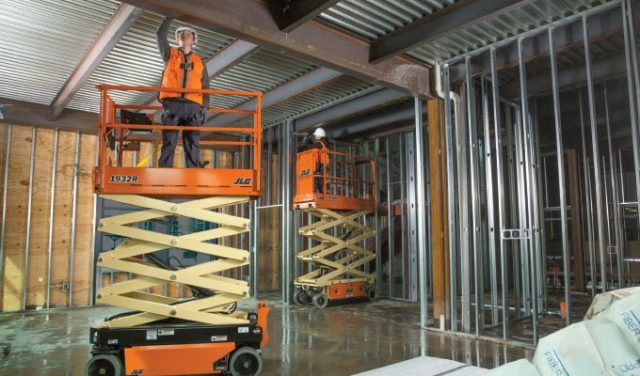 Taking a closer look at scissor lift technology allows construction contractors to make educated decisions about how these machines will impact the jobsite—from the inside out. There are typically two drive systems used in powered lifts—hydraulic and electric. Hydraulic drive systems take electrical energy from the batteries and convert it to hydraulic flow. While hydraulic machines typically cost less to purchase or rent, they can be less efficient and, in turn, more expensive to operate compared to electric drive machines. Electric drive systems have batteries essentially directly linked to motors on the drive wheels, which makes them more efficient overall. These systems require less hydraulic oil, which helps to reduce issues with oil viscosity, making them better suited for colder environments. Additionally, electric drive lifts significantly reduce the number of leak points because they reduce the number of hoses, fittings, manifolds, and other components critical to their hydraulic counterparts. Electric drive systems also boast increased battery life and fewer needed replacement parts. Replacing batteries on a scissor lift can be expensive, making it critical to have battery management software that allows the lift to consistently operate at peak performance. While contractors often try to maximize the run time of a lift, doing so may sacrifice the long-term durability and reliability of the machine’s batteries. For example, when the battery starts to drain during a shift, the output voltage also begins to drop. The battery logic helps determine how low the voltage can drop. However, the lower the voltage drops, the more the long-term durability of the battery is compromised. Pothole protection systems lower the ground clearance of a lift when elevated to reduce the risk of an accident if the machine hits a pothole. Some equipment manufacturers pin the system to the machine’s service doors, which can cause it to move in and out of alignment. Mounting the system to a stationary component, like the chassis, helps prevent alignment issues, resulting in less service and more uptime. Additionally, many manufacturers rely on duplicate components (limit switches, plungers, etc. ), which can increase the risk of system failure. Manufacturers that use one limit switch and one plunger help reduce the number of components needed to safely activate the system. It’s also important to consider what the system’s limit switches can handle. Systems with lower tolerance can move the protection mechanism out of position, which may require service. Machines designed for high tolerance will help keep operators on the jobsite and increase productivity. As buildings grow taller, so does the need for lifts with greater reach. And, as a machine’s height increases, it would reason that its base must grow as well to ensure stability. However, a wider width may not be ideal for certain situations. One solution is to increase the counterweight to stabilize the machine, but doing so can increase cost and impact ground bearing pressure. One solution is combining the base design features typically found in rough-terrain scissors with a slab scissor. A center-pin armstack, which fixes one armstack pin in the middle of the chassis, boosts stability without adding weight. This is a key component to delivering the lightest compact unit elevating to 40 feet in the industry. Combining the two systems may result in additional “slack” or “play” in the armstack. To reduce deflection, some manufacturers have deigned machines requiring only five armstacks instead of six. The fewer joints, pins, and bushings can help reduce side-to-side movement, helping operators feel more comfortable and confident. Solid-state electronics allow operators to get fault codes without swapping relays and fuses. Service diagnostic tools can be used to monitor the lift’s critical components and point technicians to the malfunctioning component or part, helping reduce service time. Technologies that have emerged from the use of solid-state controls include better horsepower management, simple reconfiguration of a machine for different jobsites, the ability to update software/hardware on a machine to comply with changing standards, softer stops for more operator comfort, and simplified calibration. Solid-state controls have also introduced new design opportunities, including variable-tilt technology. While most manufacturers completely disable a machine if there is even a minor slope, variable-tilt technology lets operators elevate to limited heights when working on side slopes greater than 1.5 degrees. There are two types of load-sensing systems (LSS): force-based and pressure-based. Force-based acts like a bathroom scale by providing a reading that calculates how much the pin has been compressed, showing how much weight is on the scissor lift. Force-based LSS provides an accurate measurement that doesn’t need to be calibrated. Pressure-based LSS measures pressure on the barrel side of the lift cylinder and translates that pressure reading into weight. While it costs less than force-based, pressure-based can pose a challenge in colder weather. Since hydraulic oil moves slower in colder temperatures, it is harder for the piston to push the oil out the rod-side of the lift cylinder to elevate the scissor. This increases the pressure in the barrel, making the machine “think” it’s trying to elevate a large amount of weight, when really the sensor is giving a false reading because the oil is so viscous. To avoid this, some manufacturers have adopted a “dual-pressure sensor” LSS, which places an additional sensor on the rod-side to calculate the differential between the barrel-side and rod-side pressure. This reduces low-temperature error readings. Choosing the right scissor lift for a job can be a complex decision. Understanding the technology behind these versatile workhorses allows contractors to choose the best lift for the job. Considering available technologies and features can deliver significant jobsite benefits and help lower total cost of ownership over the life of the machine. Rafael Nuñez is a senior product manager, scissor and vertical lifts, with JLG Industries, Inc. For more information, visit www.jlg.com.